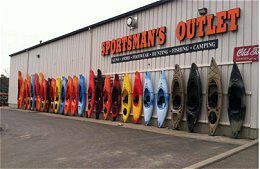 The Sportsman’s Outlet, 500 Chestnut Street, Bradford, Pennsylvania, offers guns and ammo, hunting, fishing, footwear, camping, canoes and kayaks, clothing, and an outdoor themed gift shop. Family owned and operated. Our staff are outdoor enthusiasts — they fish, hunt, hike, bike, canoe and kayak. Shoppers will receive knowledgeable personalized service. 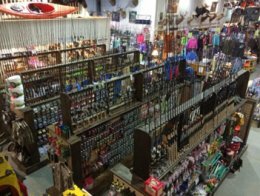 Shop here for your live bait, rods, reels and tackle for fishing the fresh water trout streams in the region or sport fishing on Lake Erie. Tree stands, camouflage, turkey calls and hunting apparel with a large selection of guns and ammo will outfit your hunting needs. Campers can select from a wide selection of tents, cots, Yeti coolers, camp chairs and sleeping bags. Hunting and fishing licenses are available. Name brand clothing for men, women, youth and infants for the outdoors and outdoor themed clothing for all ages. A large selection of work and hunting boots, Minnetonka moccasins are available. Under Armour Clothing for the whole family. The outdoor themed gift shop offers a wide and diverse variety of decorative items for your home or camp or RV. Bird feeders, clocks, lamps, and for the kids a great selection of wildlife stuffed animals. Free parking is available, parking lot can accommodate RV’s and trailers. The store is ADA accessible. Fall/winter hours: Monday – Saturday 9 am to 6 pm and Sunday Noon to 5pm. *Store hours can vary seasonally, call for current hours.